You'll love the old fashioned rhubarb pie recipes that Mom used when the rhubarb was ripe and in season. 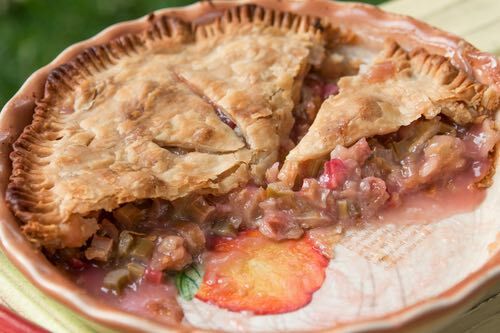 These pies with the sweet yet tangy flavor of rhubarb are easy to make and taste absolutely delicious. I absolutely love a slice served warm with a scoop or two of vanilla ice cream on top, but it's excellent when eaten cold from the fridge too. Don't put it off any longer. Go get some rhubarb and make one of the old fashioned covered, custard, or meringue style pies — they're all delicious. It's the sweet, sugary meringue topping that really sets this old fashioned rhubarb pie recipe apart. Place rhubarb in a pastry lined pie plate and prepare pastry strips for top of the pie. Mix the sugar, flour, salt, and cream together. Pour mixture evenly over the rhubarb. Top with pastry strips in an open lattice fashion. Bake at 425°F for 10 minutes, then reduce oven temperature to 350°F, continue baking until pastry is nicely browned, and the rhubarb is tender. Strip the skin from the stalks of rhubarb, more commonly called pie-plant, then cut them in pieces abut an inch long, pour boiling water over them and let them remain in it until you prepare the pie crust. Drain the rhubarb, line your pie plates with a rich pie or puff paste, sprinkle cornstarch over the paste and then sugar. Now lay in the rhubarb, sprinkle heavily with sugar, and put flakes of butter over them (you may omit the butter if you object). Cover with a rich paste and retain the juice by moistening the edge of the under crust with white of egg, and pressing the upper one upon it. Spread beaten egg over the top crust also. Use perforated pie plates and remove from the plates as soon as taken from the oven, to prevent them from sticking. Strip the skin carefully from the stalk of the rhubarb and cut it into small pieces. Scald with boiling water, then drain and press out every drop of water with your hands. Now set over the fire to stew, with as little water as possible. When done, press through a colander or wire sieve, sweeten to taste and flavor with grated nutmeg or lemon. Bake with strips of dough put across the top. I forgot to add: Beat up two eggs for each pie, after mixing the sugar. You may put in the yolks alone and use the whites for a meringue. If you do this, bake the paste first, then the custard. These old fashioned pie recipes were once used by the White House chefs to prepare pastries for formal luncheons. Cut the large stalks off where the leaves commence, strip off the outside skin, then cut the stalks in pieces half an inch long; line a pie dish with paste rolled rather thicker than a dollar piece, put a layer of the rhubarb nearly an inch deep; to a quart bowl of cut rhubarb put a large teacupful of sugar; strew it over with a saltspoonful of salt and a little nutmeg grated; shake over a little flour; cover with a rich pie crust, cut a slit in the center, trim off the edge with a sharp knife and bake in a quick oven until the pie loosens from the dish. Pies made in this way are altogether superior to those made of the fruit stewed. Skin the stalks, cut them into small pieces, wash and put them in a stewpan with no more water than what adheres to them; when cooked, mash them fine and put in a small piece of butter; when cool, sweeten to taste; if liked, add a little lemon peel, cinnamon or nutmeg; line your plate with thin crust, put in the filling, cover with crust and bake in a quick oven; sift sugar over it when served. Rhubarb, also known as pie-plant, grew in profusion behind the old tractor shed on our farm, and in the summer Mom would often gather a handful of the ripe, red stalks and prepare a couple of pies for our suppertime dessert. I can still recall the enticing smell of that freshly baked, still-warm pie sitting on the sideboard waiting for us to finish our meal. Once the meal's dishes were cleared, Mom carefully cut it and slid a generous-size piece onto each of our plates. It was soooooo good!